One of the brilliant trumpeters and composers of his generation, Taylor Ho Bynum performs most often on cornet, but is skilled with a number of brass instruments. He leads a Sextet which includes Jim Hobbs (alto sax), Bill Lowe (bass trombone, tuba), Mary Halvorson(guitar), Ken Filiano (bass), and Tomas Fujiwara (drums). He also leads the chamber ensemble SpiderMonkey Strings. In addition, he co-leads (with Abraham Gomez-Delgado) the big band Positive Catastrophe and collaborates in many contexts including The Thirteenth Assembly (with Halvorson, Fujiwara, and violist Jessica Pavone), Book of Three (with bassist John Hebert and drummer Gerald Cleaver), The Convergence Quartet (with drummer Harris Eisenstadt, pianist Alexander Hawkins, and bassist Dominic Lash), Quartet Collective, and a duo with Fujiwara. Bynum has also been a regular part of a number of the legendary Anthony Braxton’s ensembles ranging from duos to orchestras and has appeared on many of the latter’s recordings. 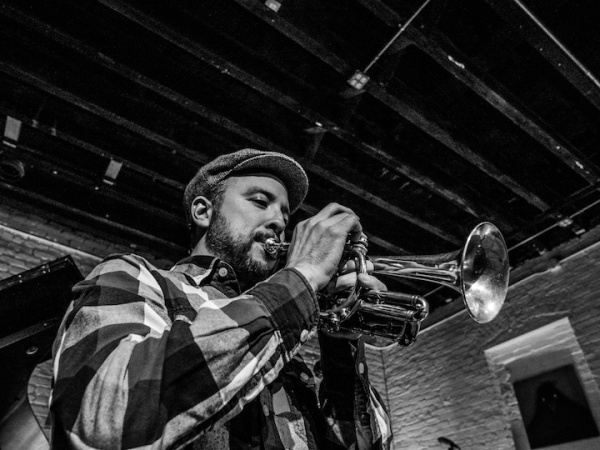 He has collaborated with Cecil Taylor and Wadada Leo Smith, and regularly performs with a vast array of influential musicians including Jason Kao Hwang, Myra Melford, Nicole Mitchell, Joe Morris, and Tyshawn Sorey. In addition, he is the vice president of Dave Douglas’s Festival of New Trumpet Music (FONT Music), a founding partner of Firehouse 12 Records, and the president of Braxton’s Tri-Centric Foundation. Bynum’s work has received support from Creative Capital, New Music USA, Chamber Music America, Mid-Atlantic Arts Foundation, the National Endowment of the Arts, the Doris Duke Charitable Foundation, and the French American Cultural Exchange, and he has toured as bandleader, composer, and performer throughout North and South America, Europe, and Asia. Bynum has also collaborated in interdisciplinary settings with artists in dance, film, and theater.